Paddy Rodgers this year will step down from his role as CEO of Euronav, the company announced today. After 18 years with the tanker owner, Rodgers is well known in the wider industry for his role in growing the once-family owned firm with 17 vessels to the largest crude tanker company in the world, listed on both Euronext and NYSE, and boasting a 73-strong fleet of vessels. 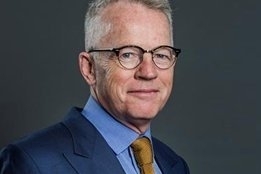 But it is his comments on marine scrubbers, particularly as a compliance choice for the upcoming IMO2020 global 0.50% sulfur cap on marine fuel coming into force from January 1, 2020, that has in recent months has seen him feature more heavily within these pages. Having emerged as one of the industry’s most outspoken voices against the technology, Rodgers has raised concern over both the environmental and economic benefits of scrubbers. Unlike many of its peers, none of Euronav’s vessels are fitted with scrubbers. “Having now completed in full the Gener8 merger I wish to pursue other opportunities and believe it is an appropriate time to hand over the baton of leadership of a strong and best-in-class large crude tanker business. I would like to thank all of the staff at Euronav for their dedication, unwavering support and professionalism in my time at the company,” he said in a statement released today. Euronav says it will now start a recruitment process for a new CEO and Rodgers will remain in his position until a successor is appointed, but in any event it seems highly unlikely there will be any shift in the company’s stance when it comes to scrubbers. “Euronav’s strategy remains unchanged and the board and management team look forward to building on the legacy created by Paddy,” said Carl Steen, Chairman of Euronav.